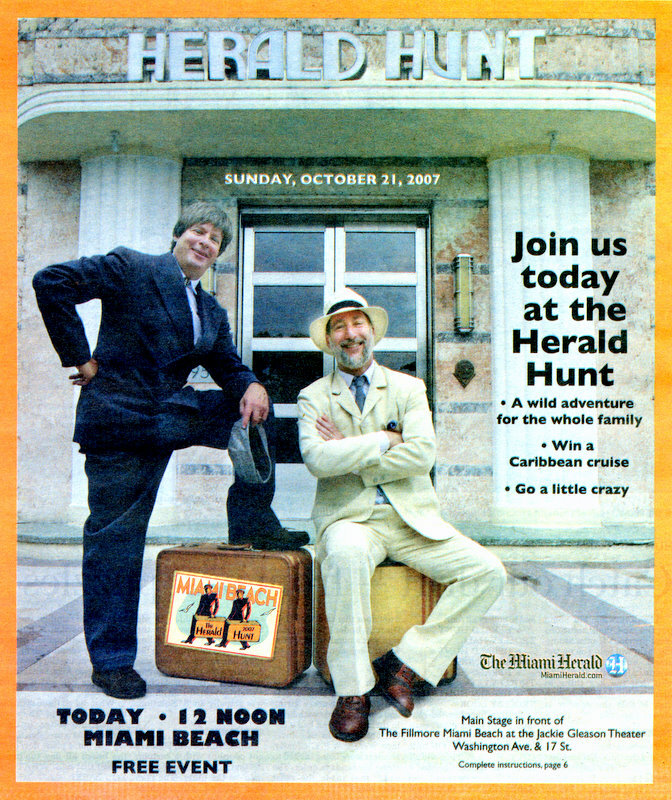 Your online guide to the zaniness of the 2007 Herald Hunt! The 2007 Herald Hunt (#16 for those that count Hunts, #17 if you count the 1988 non-Hunt) returns to wonderful Miami Beach. This is the third time the Hunt has been held on Miami Beach (1993 and 2003 previously), and it's a great setting to run around frantically in, as well as have a great dinner and/or drink afterwards. Plan on coming out, going out of your mind and having a blast doing it! 1. How many presidential-candidate debates have been held so far this year? 2. Which of the following is an anagram for "Sen. Larry Craig"? R. All of the above, as well as "Carry Large Sin"
3. Bob lives in Kendall and works in North Miami. His average commuting time is just 30 minutes each way. How is this possible? W. Bob takes the Palmetto Expressway. X. Bob takes the Florida Turnpike. Y. Bob is a fictional character. "She'll be comin' around the mountain when she comes; She'll be comin' around the mountain when she comes; She'll be comin' around the mountain; She'll be comin' around the mountain; She'll be comin' around the mountain when she"
M. "realizes that there is no way to go through the mountain." P. "finds out about the shoe sale on this side of the mountain." 5. There are thousands of vacant condominium units on the market in Miami-Dade County, yet developers are building thousands more. What is the most likely explanation for this phenomenon? D. There is actually a large pool of qualified, motivated condominium buyers, but they are invisible. N. The developers plan to ship the completed condominiums to a better real-estate market, such as China. E. The developers have oatmeal for brains. A famous American, dressed up in colonial garb, addresses the crowd after our National Anthem plays. He indicates to the crowd that he wrote that, and then just walks across the stage, commenting idly on small things around him, sometimes sitting down, talking to the crowd...because he has nothing else to do. In front of him was a sign that had three symbols on it (from left to right): a percentage symbol, an ampersand and a pound (tic-tac-toe) symbol. Hunters had to figure out that the famous American was Francis Scott Key, and that he was, well, bored. As in KEY-BORED, or 'keyboard'. In the Hunt section was a fake ad for Acme Electronics which had a keyboard in it. Using that keyboard as a guide, the numbers for each of the symbols was 5-7-3, or 573, the answer. Hunters went to the initial puzzle coordinates and were handed a golf tee with the word 'FORE' printed on it. Hunters had to guess what to do next, as 40 was not a valid clue answer. While 40 was not a valid clue, 4-T was a valid set of map coordinates. When Hunters gathered there, they found a golf leaderboard. However, each of the names had a valid clue number next to them, and there were many names. Photo - Hunt volunteers pass out golf tees and show their clubs off. Hunters had to figure out that the tee was still the answer to solving the puzzle...as in four Ts. Only one name had four letter Ts in it: Elliott Tarantino, who had a score of 288, the answer. Hunters initially encountered four Hunt volunteers wearing sandwich boards with had on them one of the following items each: a waffle cone, a chain link, Mark Twain and a key. Hunters had to rearrange the sandwich boards to put them in order: link-cone-mark-key, or 'Lincoln marquee'. Nearby was the Lincoln Theatre, and their marquee was lit up...except some letters were not lit. The unlit letters were 'Lcolna', whereas the lit letters were 'inThetre'. If you rearranged the lit letters, you got 'Thirteen', which was the answer. Hunters arrived at a location along the Lincoln Road Mall and were given a small purple flag with a white flower on it. This matched a similar flag on the map along the beach. When Hunters went to that location, they were able to watch a volleyball game using inflatable animals, each with a number on them. There was no order or reason to any animal being used. Sometimes the players just sat and relax, sometimes they were playing. A sign near the volleyball net said 'you need to know why you are here'. Photo - Hunt volunteers play volleyball�with inflatable animals? Photo - The shark is served! Photo - The zebra is served! The key to this puzzle was the purple flag. If you looked at the lifeguard stand next to the volleyball net, they were flying flags themselves (as it turns out, yellow and purple). A sign on the lifeguard stand indicated what each flag color meant. The hunters were given a purple flag, which was the reason why they went there, and looking up what it meant, the sign said "Dangerous Marine Life". Of all the animals being played with, only the shark was dangerous, and it had a number 27 on it. Upon arriving at the puzzle site, several mermaids (if some of them could be called that) were handing out red and white striped candy canes. Each mermaid wore a sash which read "Count on the Red Stripe Girl". Walking away from this puzzle, it wasn't clear exactly what Hunters had to do. The candy cane was just that; a candy cane. However, on the map, there was a mermaid that was red and white striped, like the candy cane. Going to that location on the map, there was a Lichtenstein mermaid sculpture. Counting the red stripes on it gave you the answer: 46. 13. The day after the day after yesterday is how many tomorrows more than the day before the week before two weeks from now? 27. Old MacDonald had a sea urchin, E-I-E-I-OWWWWWWW. 46. Nobody goes there anymore. It's too crowded. Who said that? 288. When the time came, and she finally understood what he had meant to her all these many years, through all those longing glances and murmured endearments, she had him taken out and beaten. 573. Then, lo, the Lone Ranger suddenly appeared in the manger, and proceeded to give a very tedious lecture about stranger danger, which not one of the three kings, who after all had ridden up out of nowhere without introduction, seemed to appreciate. Dave Barry announced the final clue: 16, 5, 6, 33, 4. Bizarrely smart Hunters figured out that each of the five numbers referred to a word in each of the five clues. Taking the 16th word in clue 1, the fifth word in clue 2, etc., you wound up with: BEFORE, SEA, TOO, BEATEN, LONE. After staring at that long enough, some teams realized that they were a series of map coordinates: B4, C2, B10 and L1. On the map at B4 was a caricature of Princess Di. At C2 was Al Gore. At B10 was a doctor. At L1 was a miner.Taken together that gave you: DI AL DOCTOR MINER. The super brains dialed Dr. Miner on the phone touch pad, which was 376-4637. A recording at that number said, "Dr. Miner is not in the office. If this is an emergency, we suggest you try Cornwald and Crabtree." Cornwald and Crabtree were both names Hunters had seen before - on the golf leader board in the "fore tee" puzzle. Cornwald's score was 187. Crabtree's was 301. Those still in the running realized that 187 and 301 referred to additional clues on the clue page. Clue 187 was "PB" and clue 301 was ''NJ.'' Together, that would be PBNJ, or PB 'n' J, common slang for a peanut butter and jelly sandwich. All that, and what do you get? You get-- a SANDWICH! For the criminally brilliant masterminds who won, a light bulb flipped on: On the map, on the broad sand ribbon of beach along the Atlantic near 17th Street, was a cartoon image. It was a WITCH. On the SAND. For the criminally brilliant masterminds who won, a light bulb flipped on: On the map, on the broad sand ribbon of beach, along the Atlantic near 17th Street, was a cartoon image. It was a WITCH. On the SAND. In other words, a SAND WITCH. They sprinted to the beach at 17th Street and found a woman with a broomstick in a witch hat and a T-shirt that said: "What's your order?" They walked up to the witch and said, "PBNJ," and won. Photo - The third place team! Photo - The second place team! Photo - The first place team: THIS is what winning feels like! CLICK HERE TO BROWSE PHOTOS FOR 2007! Photo - Team "Weapons of Mass Confusion"
Photo - Hunt volunteers BEEing everything thing they can BEE! Photo - The Streit Brothers! Photo - The Streit Brothers with Andy Wenzel! Photo - Dedicated Hunt Volunteers selling shirts.